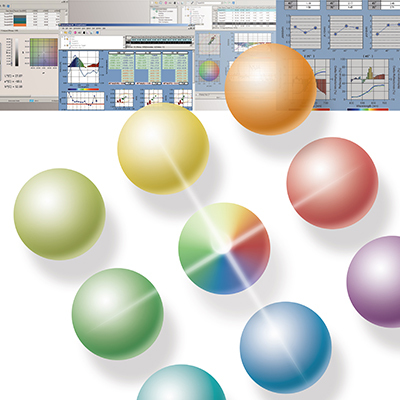 Spectramagic NX provides color measurement and control for use in a multitude of industries. From food, plastics, paint & coatings to cosmetics, pharmaceuticals, and textiles, the industries that Spectramagic NX can aid are extremely diverse. Whether your color control involves raw materials coming in, inter-process production or outbound color critical goods and materials, SpectraMagic™NX makes it easy to inspect and control color. 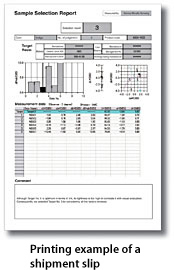 Utilize pre-defined screen templates for statistical process control, Pass/Fail assessment, and sophisticated R&D analysis. Or, design your own screen layout based on your particular industry and/or application. Each graph type (colour, spectral, trend, or colour difference), as well as the data list, can be scaled to the desired size quickly and easily. SpectraMagic™NX – lots of options to help you choose just what’s right for you. SpectraMagic™NX allows you to insert digital pictures into your measurement data while marking the exact measuring spot. This creates novel ways in which to communicate about color with customers and suppliers. The Data List View allows you to swiftly export measurement data into Excel using the copy and paste function. Reports can be customized to show color data in a format that meets end user requirements. Any graph can be copied into a spreadsheet by the “drag and drop” method. Additionally, SpectraMagic NX can share data within a local area network (LAN) and operate under Windows 98, SE, NT4, 2000 Professional, XP Professional, and Vista. Another “world first” is the exclusive navigation function of SpectraMagic™NX, which combines a “step by step” online help for basic operations with freely customizable macro functions for repeated standard procedures on the production line. SpectraMagic NX Uses HTML coding to allow for total customizations of operations, conveniently illustrated through digital pictures and on screen instructions. To improve general knowledge for beginners and experts alike regarding color basics and color measurement technology, SpectraMagic NX comes with a unique online tutorial from Konica Minolta’s award winning booklet “Precise Color Communications.” This booklet explains important topics, such as color basics, chromatic systems, standard illuminations, tolerance settings, and suitable measuring geometries. SpectraMagic™NX can be interfaced with all current Konica Minolta Chroma-Meters (CR-400 series) as well as all portable and bench-top Spectrophotometer models. By using the same platform across the board, quality control is made more versatile throughout your organization. Requirements in screen layouts differ by application, from simple Pass/Fail assessment or statistic process control to detailed analysis for R&D work. SpectraMagic NX comes with several pre-defined templates to choose from, or you can create your own screen layout suiting your needs and application with total freedom and flexibility. 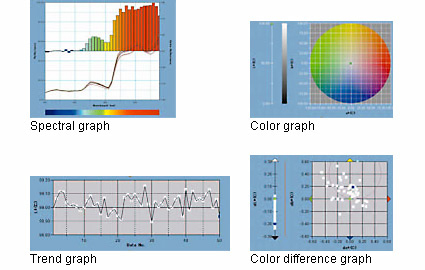 Each graph type (Color, Spectral, 2D/3D, Color-Difference or Trend) as well as the data list can be scaled to the desired size with total ease. Target data of one master target (primary target) can be associated with two or more working targets (regular secondary targets). 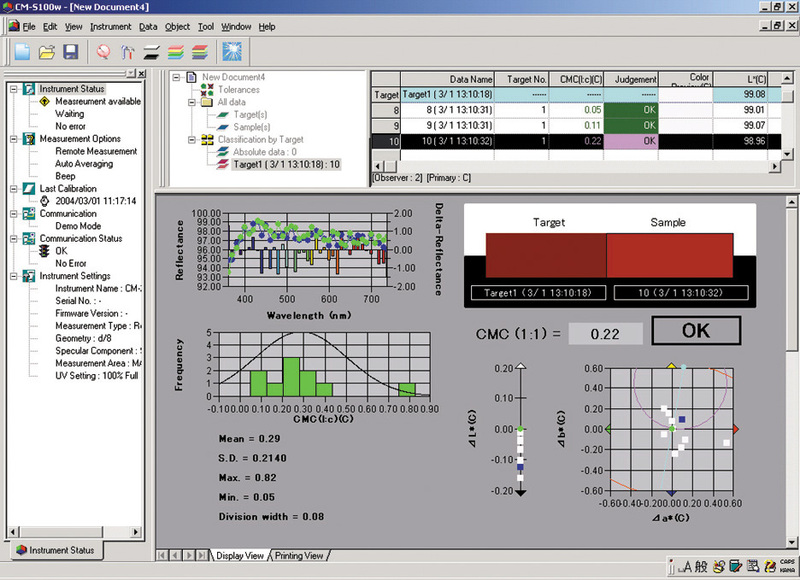 This allows for sophisticated QC applications such as checking for color differences between the regular targets and master target simultaneously. Or, the color differences of an entire product can be managed in sections by comparing the differences from the target color of each section. The minimum ellipse to enclose several samples can be calculated automatically and specified as tolerance. 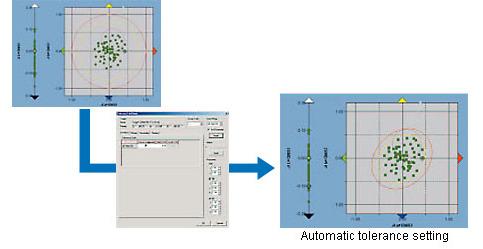 The automatic tolerance setting enables pass/fail judgment using three color difference equations, CMC(l:c), CIE 1994 and CIE DE2000, which provide results similar to visual evaluation and are being adopted increasingly by companies and organizations. Additional information can be input*2 for measurement data, which is useful for organizing, sorting, or searching for data. These added items can also be displayed on a graph. Information such as Model name, item name, product No., code No., name, order No., color No., production lot No., customer name, product name, visual judgment result (pass/fail input), temperature, humidity, etc. can be input. *2: Additional items cannot be input by Lite Edition. Input items using Professional Edition can be also used on Lite Edition. Like the display view, you can create your own printing view format by placing and editing objects as desired. This function is useful for preparing easy-to-read reports or for filling in shipment slips. Moreover, several pieces of data can be combined and printed on one sheet. SpectraMagic NX helps you to make color quality control easy and comprehensive at once. 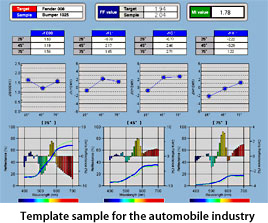 You can choose from several graphs together with the latest Pass/Fail color difference assessments equations, such as CIE 1994 or CIE DE2000 and several industry related indices. Tolerances, both in box or elliptical form can be automatically calculated or manually adjusted to approved standards. 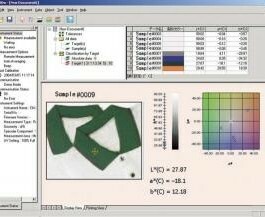 Furthermore, SpectraMagic NX features a “User Index” function that allows you to configure up to 3 customized color equations to meet industry-specific requirements for color evaluation. Auto Target is an additional feature that makes QC with SpectraMagic NX so easy and fast. ΔE00 (CIE DE2000) is an improved color-difference equation based on the L*a*b* color space which provides better correlation between the color difference value and visual evaluation for subtle color differences. Templates designed for various applications are ready for immediate use. The SpectraMagic NX also supports the CM-512m3 multi-angle spectrophotometer, which provides measurement values using three illumination angles with one measurement. 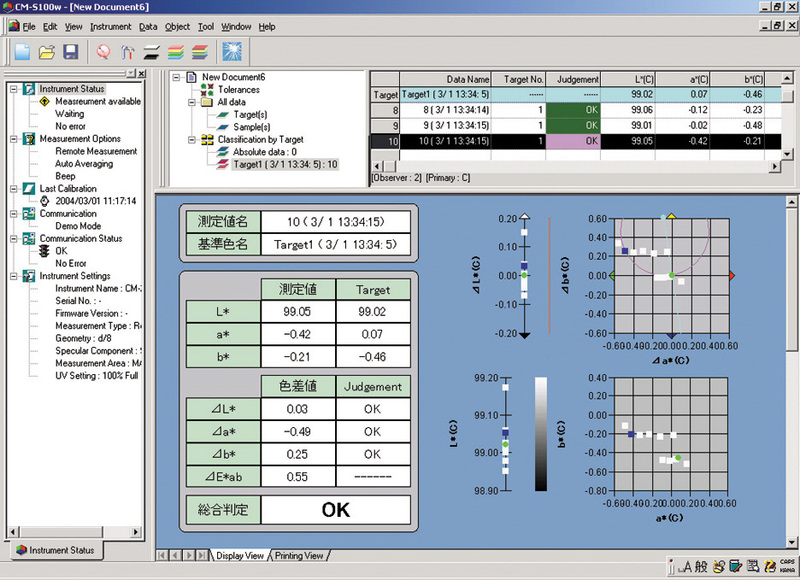 The data of the three angles can be displayed simultaneously, and the angle characteristics specific to multi-angle spectrophotometer can be displayed visually with line graphs. With SpectraMagic NX, all Instrument Information (status, measurement options, last calibration, communication status and instrument settings) can be seen at a glance. 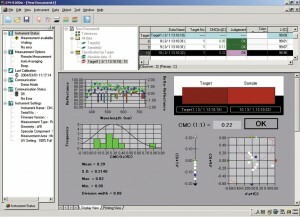 The SpectraMagic NX is data-compatible with the former SpectraMagic software. The old data can be used without any treatment. SpectraMagic NX allows you to insert digital pictures with the measured data, opening totally new dimensions to color communications with customers. The data list view allows you to swiftly export measurement data into Excel by copy and paste function. Reports as well can be created by the user with total freedom to meet traceable evidence of color consistency demanded by customers. Furthermore, SpectraMagic NX can share data within a local area network (LAN) and operates under Windows® 2000 Professional and XP Professional. You can easily register routine operation flows as macros using the menu screen*3 to automate the operation processes. This is effective for reducing working time as well as preventing operation mistakes. With the exclusive Navigation function, you have total control of the flow of operations with online step-by-step instructions including picture illustrations. This unique feature can be customized by the user according to his needs. 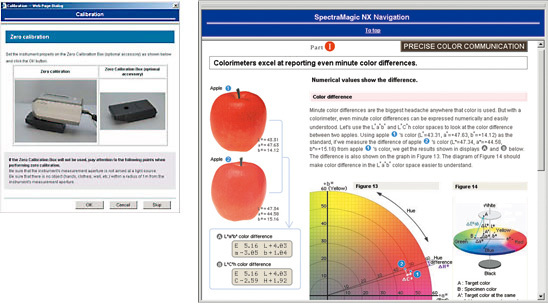 The Navigation window of SpectraMagic NX also includes a link to the HTML version of “Precise Color Communication” with many illustrations and explanations that contribute to a clearer understanding of basics and technical terms related to color and color measurement technology. *The hardware of the computer system to be used must meet or exceed the greater of the recommended system requirements for the compatible OS being used or the following specifications. *With some instrument types, the illuminating/light-receiving optical system may not satisfy the deﬁnition of haze (ASTM D1003-97). However, this presents no problem as long as the value is used as a relative value. Operation is easy thanks to an operation screen with large buttons, use of function-assigned keys instead of a mouse, the Navigation function, and the Macro function. * Specifications are subject to change without prior notice. * Windows® is a trademark of Microsoft Corporation in the USA and other countries. * Pentium® is a trademark of Intel Corporation in the USA and other countries.